PestRoutes pest control software and suite of field-ready applications (Android and iOS) provide business owners with the ability to manage every aspect of the business. Pest control companies can eliminate paper, manage accounting and invoicing, access a comprehensive dashboard, customize reports and analyze business performance with one login. PestRoutes provides convenience for customers via an online portal. 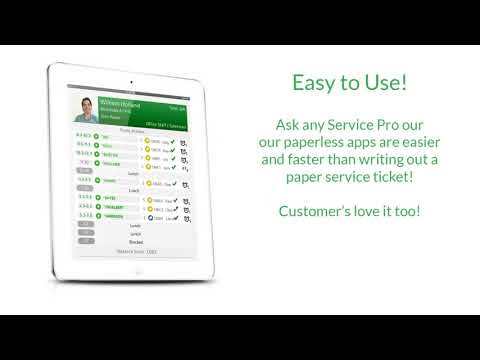 Auto pay, renew contracts, authorize SLA's, and leave feedback and social reviews with the touch of a button. Whether from the office or on the road, PestRoutes allows appointment schedules to be dragged and dropped into shape, task lists created, real-time reports generated and even a library of resources accessed for training purposes. Field-ready tech applications include smart routing that geo tracks and monitors technicians, provides simple customer sign up and inventory control management. With PestRoutes pest control companies can make data-driven decisions with a comprehensive dashboard, custom reports and analytics that provide insights on growth, profitability and retention. We started using the software just about a year ago, in December of 2015. A rep came and showed us the basics, answering many questions with the utmost of patience. After the rep left, we had to call into the Pest Routes Customer Service department, many times. The customer service agent and her team of customer service representatives always helped us out, with a smile, despite the repeated questions. If the agent, or her team, couldn't give us an instant answer, they would create a ticket and get back to us. I would recommend this software to anyone running a pest control office. It has so many utilities included in the software, such as various reports detailing types of customers (those who pay with checks/credit cards/cash and how much and often they pay). It also has the ability for customers to leave feedback on the technician (which is also detailed in another report). It's easy for customers to be contacted for any voicemail the office can create beforehand as well as emailing/leaving voice-mails for the customers regarding their next service including time frames. I can go on and on, but I'm sure it's all in their marketing material. Great product with a great customer service/development team!The best feature of PestRoutes is the method of notifying customers of their next service. We have the option of SMS (texting), emailing and calling (all optional, at the customer's request). The best feature of PestRoutes is the method of notifying customers of their next service. We have the option of SMS (texting), emailing and calling (all optional, at the customer's request). I don't like the Paid In Full report, not very functional for those with multiple subscriptions. I have use pestpac then switched to serve suite and then to PestMate for 2 years (which I liked PestMate) but Pest Routes has been by far the best, navigation speed is much better than PestMate, Routing system is the best I've seen, Easy to train employees on and the reports are clean and one of my favorite parts is you can really run any data point from the customer section. If I want to know how many active accounts are ontime services I can generate a report giving what ever data I want; address, phone number, there last service, anything. Lets say I want to know how many of those customers have a card on file or were sold via Yelp so I can know if a source I'm paying to get customers from is bringing me a lot of onetime services I can know all that. Pricing is great too. I wish it integrated my communication systems like emails and phone system. I've been told for a 6 months now the phone integration is coming but no word yet. Thank you for your comments and feedback. We're working on the product roadmap and will keep you informed on the emails and phone integrations. Overall experience has been great - a for sure improvement over Pestpac (except in the scheduling department). The support team is friendly & knowledgeable as well.The software is easy to use, especially when running reports. There are multiple reports that gather any information you could possibly want. It is easy to train & continues to receive updates that benefit our company - employees & customers. It is clean & modern - enough information on each page without making it appear cluttered. The software is easy to use, especially when running reports. There are multiple reports that gather any information you could possibly want. It is easy to train & continues to receive updates that benefit our company - employees & customers. It is clean & modern - enough information on each page without making it appear cluttered. Scheduling could be improved. If a technician arrives at a stop out of order, it does not put it where he clocked in. We then have to review the QA reports just to see how he checked in. The combo of some of the access controls make it difficult for management to ensure employees are not adjusting items they shouldn't - invoices for example. Thank you, Ashley! We're so glad the software has made it easier for you to run reports. We'll take your great feedback on scheduling. Super helpful. The software has streamlined our service process and eliminates many of the redundancy in any office. Not to mention eliminating a lot of labor cost and printing. I like that the software incorporates most all of the tasks we need in one product. routing, billing , sales and communication all in one system. The developers have been able to re tool some of the apects of the software to better serve our specific needs in our business. I like that the software incorporates most all of the tasks we need in one product. routing, billing , sales and communication all in one system. The developers have been able to re tool some of the apects of the software to better serve our specific needs in our business. What I liked least originally was that we found it to be geared specifically to one service. This would be pest control services. We on the other hand are built equally on termite and pest control so we had to find work around solutions. As stated on the pros however they have listened and created solutions to better serve customers built as we are. Thank you for the great feedback. We've got some exciting announcements on the way to address service expansion. I really have no complaints. I've used other software for my business and when we made the switch to PestRoutes, it has made our lives so much more easier. We don't need as many hired staff either, because of the level of automation and efficiency built into the software.PestRoutes is fast, easy to use, and allows us to be highly productive. PestRoutes is fast, easy to use, and allows us to be highly productive. The team is always working on innovating the software. This sometimes can lead to parts going down for a brief time, or errors. However, the support team is awesome! They are highly responsive to anything you bring to them, and listen to suggestions for improvements. I've actually had them implement features from my recommendations. PestRoutes is pest control that combines centralized online access, a self-service customer portal and mobile app support to digitize operations, go paperless and minimize dependency on data entry. The system syncs job appointment information with real time updates, while using geotracking technology to monitor field technicians on a map. Bar code scanning support enables the management and tracking of equipment, traps and stations deployed on field sites. Intelligent routing promises to plot the most efficient journey plans for a whole roster of appointments, using built-in algorithms to optimize driving time and route costs while being flexible enough to accept changes via drag and drop edits. Automated appointment reminders and confirmation requests are sent via voice, SMS or email and give customers the ability to digitally sign service agreements or contracts. Further features go on to include integrated billing and invoicing with batch online payment processing, customer review collection with social media marketing, dashboard-based reporting, task management, staff training resources and time sheets for assisting payroll. Below are some frequently asked questions for PestRoutes. Q. What type of pricing plans does PestRoutes offer? Q. Who are the typical users of PestRoutes? Q. What languages does PestRoutes support? Q. Does PestRoutes support mobile devices? Q. Does PestRoutes offer an API? No, PestRoutes does not have an API available. Q. What other apps does PestRoutes integrate with? Q. What level of support does PestRoutes offer?